Inspired inside and out by film, this compact system camera has a unique hybrid viewfinder and totally redesigned CMOS sensor, a great synergy of traditional and forward looking designs. This imaging sensor is quite unlike any other previously sold in a digital camera. Inspired by the random grain pattern of film it avoids repeating patterns in the red and blue pixel filters in the array. This removes the need for a low pass filter and so cuts-out moiré and false colours. The result is images of much improved colour accuracy. Specially designed for the X-Pro 1 , Fujifilm XF lenses represent the pinnacle of Fujifilm camera lens design. Using aspherical elements and Super EBC coatings, they produce exceptional image quality and edge-to-edge brightness thanks to the specially designed light path behind the lens. Another first for this camera is its unique hybrid viewfinder. On what other camera will you find both optical and electronic finders built into the body? You can instantly switch between the two and even when using the optical finder there is an electronic overlay (like jet pilots have) showing the framed area and camera settings. If you are using an XF lens the magnification of the viewfinder will automatically change. 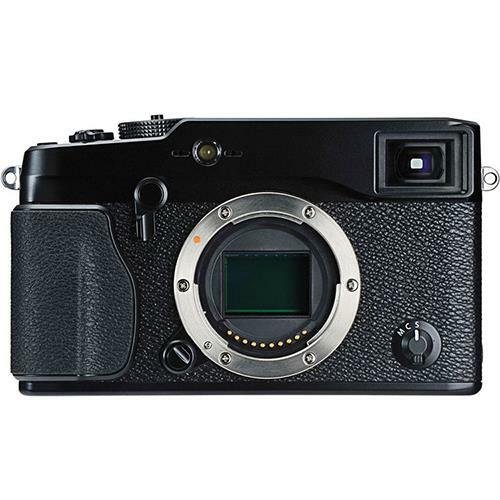 Fujifilm have made the X-Pro 1 a true system camera and several useful accessories are available such as a hand grip, EF-X20 flashgun and leather case. EISA Award - The Fujifilm X-Pro 1 won the EISA Award for Professional Compact System Camera of the Year 2012-2013... "It is a combination of exceptional lens quality, great build and a revolutionary new sensor design that makes the Fujifilm X-Pro1 such a successful camera." Review from What Digital Camera magazine - "The X-Pro1 is a staggering camera.....Images are exceptional, delivering on the claim that it can match up to existing full frame sensors' abilities. The hybrid multi-viewfinder is also a joy to use and a genuine unique feature to Fujifilm. Add great build quality, decent manual focus control, an exceptional HD quality LCD screen and there's little more to ask for."